At Huber Lumber Co, we are committed to providing a comprehensive range of building supplies for construction projects in the Cincinnati, OH area. We're far more than a simple, traditional lumber yard, we are constantly organizing and sorting our stock to make it easier for you to find the exact items you're looking for--and perhaps a few you didn't even realize you needed. Family owned and operated since 1903, we stock not only a variety of building materials but can order rare items from our network of specialty suppliers to suit your particular needs. Our Mill department will help to customize items uniquely to fit your project. Services Huber Lumber Co is a full service provider of building supplies serving the Greater Cincinnati area. Among the many building supplies and services we offer in Norwood are: Building materials Lumber Kitchen cabinet and kitchen design Decks Patios and porches Windows and doors Whatever you need to give your construction project a unique flavor, you're sure to find it at Huber Lumber Co. Come in to our store to see all the materials we have available. We're also happy to help you locate a particular item if you have something particular in mind. Our team Huber Lumber Co's Cincinnati-based team is passionate about woodwork. Our staff is available to consult with on all kinds of projects, and can offer their expert advice about exactly what kind of building supplies would best suit your home or building project. We thoroughly enjoy the opportunity to assist people in realizing their dreams, while doing the best thing for your home. It's a win-win for everyone! Cabinets and Cabinetry in Cincinnati, OH! Our Story Jim's experience began when he was just a teenager working with his father on his own painting business. His interests turned to construction and carpentry. Jim worked at Hanson-Millay Company for 10 years. His commercial experiences included several small and large retail businesses in Northern Kentucky and Ohio. He also gained experience building and finishing office spaces, commercial rental properties, and church buildings. While working at Hanson-Millay, Jim earned his Journeyman Certificate for Carpentry. Jim's interest began to change once his own family began to grow. Desiring more flexibility, he decided to leave Hanson-Millay and begin his own business as Creative Builders. Jim's determination and hard work produced a successful business providing quality home improvements. three years later, Jim was presented with an opportunity to expand his business providing Kitchen and Bath cabinets to his clients. Creative Kitchens became mildly successful, but confusing. Many believed Creative Kitchens was a cooking school. Jim relocated his cabinet business to his home, building a showroom and office for his business and changed the name to the CabineTree. Our Story Jim's experience began when he was just a teenager working with his father on his own painting business. His interests turned to construction and carpentry. Jim worked at Hanson-Millay Company for 10 years. His commercial experiences included several small and large retail businesses in Northern Kentucky and Ohio. He also gained experience building and finishing office spaces, commercial rental properties, and church buildings. While working at Hanson-Millay, Jim earned his Journeyman Certificate for Carpentry. Jim's interest began to change once his own family began to grow. Desiring more flexibility, he decided to leave Hanson-Millay and begin his own business as Creative Builders. The CabineTree is truly a family owned business. Jim's wife of 25 years, Kim, works by his side in the CabineTree's office. Together, it is their desire to provide quality products for the home, exceptional service, education and experience to homeowners for their kitchen and bath projects as well as their other home improvement needs. The professionals at Dayton Custom Cabinets specialize in providing custom cabinet solutions to fit your individual tastes and lifestyle. We have been helping Dayton area residents for over 30 years with improving the look, functionality and overall value of their homes through custom cabinet installation. We pride ourselves in listening to your needs, and then working closely you to create the cabinets and vanities of your dreams. A custom solution doesn't have to be expensive, as our team of designers and installers work to provide solutions that are affordable – regardless of how large or how small the job may be. We are confident that once you contact us for a free consultation, you will discover what hundreds of satisfied clients already know – when it comes to adding value and style to your home, no one can beat Dayton Custom Cabinets! Creative Cabinet Innovations specializes in cabinet refacing. We pride ourselves in great attention to detail to give your cabinets a fresh new look without the hassle and mess of tear out. A local business specializing in cabinet refacing. We also offer granite countertops. Remember..."You don't have to replace 'em! You can reface 'em!" L-L Cabinets has been servicing Dayton, Ohio and surrounding areas, since 1975. We provide quality products & workmanship at reasonable prices. And we use only the best materials such as Wilsonart & Formica. We service both Commercial and Residential customers. There is no job too big or too small. We provide custom countertops that are built to specification right here at our Dayton, Ohio facility. Additionally, we build custom cabinets, and we sell leading brand name cabinets. 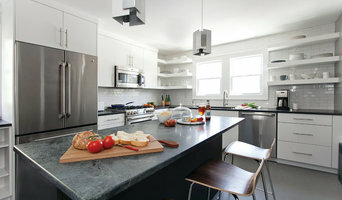 We also offer installation services for both cabinets & countertops. We provide FREE estimates that require no obligation. If you would like to request a FREE estimate, or if you have a question, pleae do not hestitate to contact us at 937-237-8880.